After 2001 this is the second Essencia produced by young rising star winemaker István Dorogi, presenting the very loess-based fruity style of the vineyards of Tarcal on the slopes of the Tokaj Hill, called "Kopasz". Excellent botrytis scent and flavour, with dominating apricot and quince pear aromas. 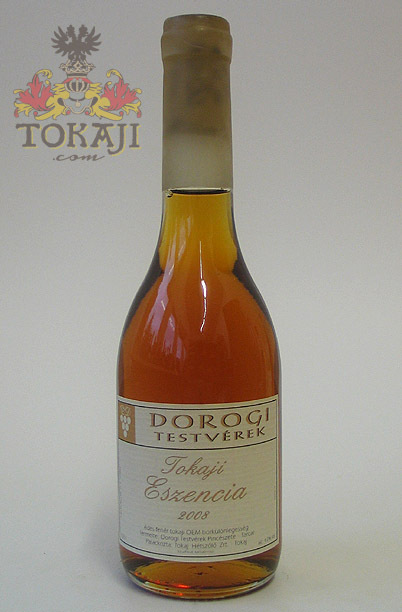 István Dorogi's Essencia is a blend of grapes harvested from several vineyards around Tarcal, amongst them are Barát, Elöhegy, Thurzó, Mestervölgy and Mogyorós. All these small tracts are situated on the slopes of the Tokaj Hill, called "Kopasz", facing open space towards sun from east to west, so they can be shined by the sun the whole day long without interruption.